Mr. Xplorer’s Upvote Service is a service to minnows that are getting few post upvotes. We aim to provide steemians upvote service that are affordable yet getting a lifetime rewards. 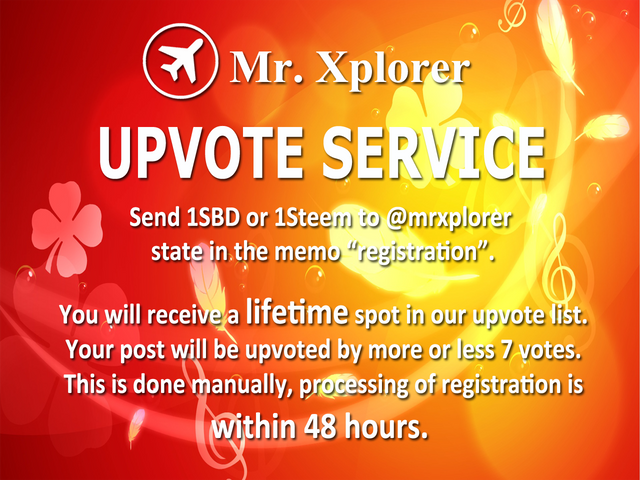 Any Steemians who will enroll in this service will be included in the upvote or curation list of @mrxplorer with a trail votes from 8 curators. The curation trail may increase as more Steemians are willing to follow our curation trail. Once you become a member, you will receive a LIFETIME spot in our curation trail. Since the service is just starting the accumulated value of the curation upvotes may vary from $0.005 to $0.01. Steem Power of @mrxplorer is now 50SP. As more members arrive, our Steem Power will increase as well. We will allot 75% earnings of this service to power-up @mrxplorer account to help our community not only upvotes but also get higher vote value. As our curation rewards increase @mrxplorer will get stronger every day. How To Join Mr. Xplorer Upvote? Send $1 SBD or $1 Steem to @mrxplorer account, in the memo field type “registration”. Since this is done manually, we will process your request within 48 hours after sending the registration fee. We will send you $0.001SBD to notify you that your request is approved. We will upvote your latest post that is 5 days old and earlier. You will be included in our curation trail for life. Note: We are looking for high quality content, thus we reserve the right to decline enrollment. Spammy account will not be accepted. You will be added to #UnliSteemersPh facebook group page and discord channel to promote your post to more steemians, just strictly follow the rules of the group. Spamming is not allowed. Follow @unlisteem to resteem your post. To communities that have new members, you can sponsor them with this upvote service just follow the steps in joining. Just include the account you want to sponsor after the word “registration”. In order to grow our community, please resteem this post and tell your Steemit friends about this upvote service.